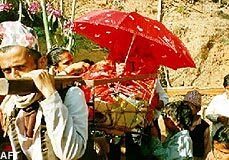 Wedding customs in Nepal vary according to ethnic groups and castes. 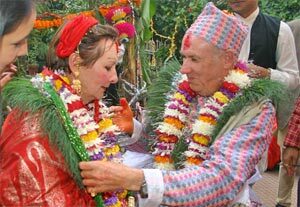 Especially country like Nepal, have different kinds of wedding ceremonies because we have varieties of cast and creeds. Weddings in the metropolitans have parades or car for the wedding processions; full fledged band instruments such as trumpets and trombones, ferry lights all over the house which is naturally more expenses. These weddings are completely different from the traditional remote village weddings. They are very simple for very rich in culture. Wedding in Nepal is a multi day event, which may engross an entire village. In its essence, it reveals the very strong social and communal values of the Nepali people. Few things in Nepali culture take precedence over a wedding and most people treat the time as the opportunity of a lifetime and a time to hold back and celebrate with varieties of foods, fun and dancing. 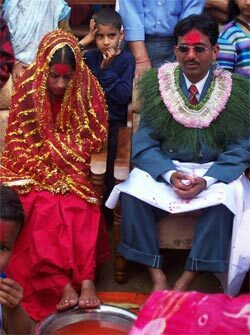 Weddings generally take place in tender age in Nepal. It is normal for boys and girls to be married during their teens but in few cases in very young ages. The wedding procedure usually begins with an arrangement of a boy and a girl with comparable backgrounds; often with the help of a priest who are well know as matchmaker. The meeting takes place between the parents of the two families. In an arranged marriage, it is the parents who choose their children's partners. One additional note concerning the arranged marriage: even though the parents choose the individuals, the children are commonly given a voice to accept or decline the match. There are instances, however, of a couple not seeing each other for the first time until the ceremony begins. In a love marriage, it is the boy and the girl who choose their mate. Today, both types can be found throughout the country but it is the arranged marriage that predominates. However, the love marriage method has been gaining much acceptance over the years perhaps due to the influence of western culture and more over with the drastic develop in media. Eloping may occur between couples that are not thought to be a suitable match in case of different castes & tribes. Castes are in many ways an extended family. And there are cultural rules that dictate that one must marry into the same caste, but not the same family. There are many small villages today that are predominantly one family. Therefore it is common that a one must look to neighboring villages to marry. This explains why most village marriages are a marriage between one person from one village and the other from another village sometimes days apart. It also explains why marriages last many days as logistics and travel prevent a single day event. After the initial marriage arrangement takes place, the wedding begins with a gathering of the traveling party at the groom's house. 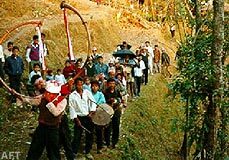 Celebrations are made and rituals are performed with the local priest and the party then travels to the bride's village with the procession... This party particularly consists of males only. Once the procession reaches the bride's village, the groom's family gamble, drink while the priest performs the ceremony followed by a big feast. One of the important events in our traditional wedding is that the groom puts a pinch of red-coloured powder on the bride's forehead. This symbolizes that they are now husband and wife. This red color on the woman's forehead differentiates whether she is married or not. The bride and groom by tradition are always carried either in a wooden casket or by horse (if financially feasible). The bride after being handed over to the groom by her parents will then travel to the groom's village to become a member of his family's household. The Nepali way of life is completely different in comparison to the West. The inheritance goes to son if one and will be divided in to equal part if there are more. The married couples almost always live with the groom's parents. Traditionally the couple will either inherit the parent's land and house or eventually build their own house when feasible. The ceremony is a very serious affair for the two young people. The bride is dressed in red, which is the color for marriage. Often, she sheds tear as the time to leave approaches. This may be a true feeling of apprehension of leaving the home and family or it may be just a traditional requisite. But many young girls cannot wait to leave the boredom of their life and look forward to having a family of their own. As we have seen the different way of wedding such as wedding in the air during sky diving, under water wedding in ocean during scuba diving, wedding in the highest peak of the world, Mt. Everest during expedition any many more unique ways to cherish the moment for lifetime. The traditional Nepali wedding is one of those experiences to gather. 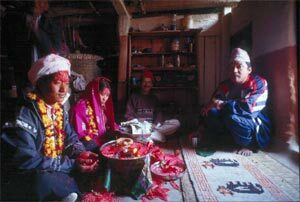 As mentioned earlier, wedding customs in Nepal vary according to ethnic groups and castes we have tried to cover all most all different tradition as follows.